The scoreline is stunning. 67 for AAP, 3 for BJP and 0 for Congress. Yes the exit polls got it wrong, the AAP did far better than anyone could ever have predicted. This is, of course, right about the time two narratives emerge, the victor’s and the vanquished. For the vanquished, the loss is because the media was in the tank for the other team, our organization dropped the ball, the winner benefited from Cause A that was not in our hands, and finally that old chestnut, look at their vote-share, they didn’t even x% of the total vote. For the winner, the victory is a new horizon in Indian history, a win for the forces of good over evil, of the will of the people over money-power, and feel free to throw in your own cliche here. We saw these two narratives emerge after the Lok Sabha election, and they emerge here once again, except that the people pushing the narratives have been interchanged. Not that these narratives have no truth in them, except the sulking vote-share argument, but a realistic analysis is in order, one that is made without Arnab Goswami trying to shut you down. Is this the proverbial blow to Modi? The answer is “yes and no”. It is “yes” because, for reasons best known to them, the BJP actually made it into a mandate on Modi. Perhaps it was because of a lack of faith in their local leadership (we shall come to that later) or because the performance of BJP corporators, as I understand it, has been less than stellar, Amit Shah brought in political rhetoric more appropriate for a Lok Sabha elections, and in a State elections, there is a cognitive disconnect when you do that, because people want to hear about local issues. As an example, in a speech that I heard on TV, Amit Shah kept on saying how under Modi sarkar, Pakistan may start border skirmishes but India finishes it. Even if you are impressed by the nationalistic narrative in the speech, why would you want to vote for the BJP at the state level based on that? By bringing issues that had the risk of irrelevance and by making Central ministers bear the bulk of political communication (as opposed to state leaders), the BJP made it about Modi, which is a very risky strategy in a state, where their electoral prospects had already been made dodgy (and they should have known this) by the inevitable vote flight from a broken Congress and the consolidation of anti-BJP-votes under one banner. It is also “no” . The Modi government has neither been an abject failure, partially because of factors they cannot be credited for like falling global gas prices, nor has it been a stupendous success, specially in terms of its roll-back on corruption. The most pragmatic assessment of the Modi Sarkar is that it is firmly in the band of “acceptability” (or as my school teachers would write in my report card V. Fair) as far as governance is concerned. If Lok Sabha elections were held today, Modi would still win pretty handsomely, and many of the people who voted for Kejriwal for the State would vote Modi for the Center because at the time of writing, there is still no national alternative to BJP, with the Congress having passed away. Also lest we forget, this same party was winning one state after another, only till very recently, and nothing catastrophic has really happened, except Modi’s questionable fashion choices, to sink the government. So then, what happened in Delhi? The first thing to consider is that in terms of state elections, Delhi is very special. It is significant politically purely because of the media attention it receives by virtue of it being India’s political and political news capital. It is also special because it is a city-state, that has both affluent and highly educated class, less prone to politics of caste and religion, as well as poor migrant workers. Because of the fluid structures of migrant communities, the baggage of caste and religion and history is not as heavy for them in Delhi as it would have been back in Bihar. Which is why both the rich and the poor, are more interested in questions like “What is in it for me?” as opposed to “What’s the religious/caste identity of the candidate you are putting up”. In other states, an Amit Shah can cobble together strategic caste alliances, or pit local satraps against the other, or play up to local chauvinism, and that’s sometimes enough to give him victory, but in a place like Delhi, it’s mostly about getting the messaging right. And there the BJP absolutely tanked. Even its counter-messaging, or negative campaigning, was all wrong. It attacked Kejriwal for being a “bhagoda”. Kejriwal promptly “apologized”. I put the quote-marks because it was not a real apology, for that would have “I was auditioning for PM-ship because that’s what I wanted, I used my time in the government to primarily get into the national conversation, I jettisoned the government strategically to pursue my ambitions for being a PM, I spread my resources too thin, and I am back now to my old job”. But then again, it was still an apology and given that Indian politicians never say sorry, and the Indian electorate is more than forgiving, the apology was powerful enough to totally take the wind out of the sail of that attack. It attacked Kejriwal for accepting donations from shady people “at night” which actually ended up shifting the conversation to political funding in general, which, to put it mildly, is not BJP’s strong suite, corruption is a important issue in Delhi than, say, it would in the backwaters of Bihar. And over the last few months, it has let the Sakshi Maharaj and assorted other loonies emerge as their most popular faces. Modi’s mandate, in urban India, was development, and the kind of wide media play these fringe elements got (and it is a virtuous circle here, the anti-BJP media will cover the worse stereotypes of right wing politics and the same elements will revel in that coverage) did real harm to the party, specially in mild places like Delhi. In contrast, AAP got the messaging correct. It was also appropriately negative but it constructed the narrative around familiar middle-class bogeymen, namely sinister big business houses and vague conspiracies to tamper with EVMs and other assorted inflammables that would get the old boys all agitated during their morning walks and community samosa-eating. And in it’s positive messaging, it had everyone beat. If elections are about “What will you do for me?” the AAP came up with such an extensive feature list of deliverables that it was no wonder that BJP didn’t even want to get into a feature fight-out with them, delaying their manifesto as much as they could. It had a free “something” for everyone, from bijli and paani right up to Wifi, a veritable Santa Claus in February. CCTVs? We will install 15 lacs of CCTVs and boom woman’s safety. How will one pay for 15 lac CCTVs? Ah well, did I tell you about the new power plant we will set up? How? Where? How much will it…Err wait, have you seen point number 45? It’s frightfully easy for AAP to play this game, because they have never been in power before, and so have no record of not-kept-promises. Oh yes, there was that 49 day thing but they have apologized for it. So it’s cool. Now that they have been elected and come to the business end of the promises, it will be interesting to see how much of that was “jumla”. If I can hazard a guess, the most likely outcome of most their promises will either be non-fulfillment (the 15 lac CCTVs for instance), or a transference of blame to the Central government for the “stepmotherly treatment” accorded to Delhi. I use the term “stepmotherly treatment” from my personal experience of having grown up under CPM rule in Bengal, these being exactly the two words they used to explain everything from why Jyoti Basu’s ambitious Bakreswar Power Plant, which would solve Bengal’s power problems, (note similarity) to why the long laundry list of promises made to voters was not being followed through. The similarities I find between CPM of the 80s and AAP is striking. Both subscribe to politics of extreme populism, both are strongly cadre-based, both have many genuinely likeable and committed people who felt there were making a difference, and neither could never really explain how they would fund all that they promised. The only difference was of course that CPM was idealogically monochrome, namely red, while AAP is a rainbow tent, from “give Kashmir independence” types down to mild nationalism, chameleon-like, different things to different people, and absolutely perfect for a heterogeneous urban center like Delhi. Which finally brings us to leadership. BJP had none. It waited too long, hemming and hawing about their Delhi strategy, giving their opponents time to get off the ropes and have a shower-down. They had little trust in their local leadership, having sent the reliable Harsh Vardhan to the center, and when they brought in Kiran Bedi, it was too late. Perhaps even more damning, she was the absolute wrong choice. In elections for a place like Delhi, where messaging trumps caste, it is very important for a leader to be an effective communicator, and Bedi, with her angry school principal demeanor and her scrapbooks, was just not cut out for this. Because BJP felt they were so light on leadership, they poached Shazia Ilmi and Krishna Tirath from AAP and Congress, and this like was an IPL franchise buying Dinda and Nehra to bolster their pace attack. They did bring the cavalry in, late in the game, but that just made things matter worse, raising the stakes in a battle they had been losing for a while. In contrast, AAP was supreme. In AAP 1.o, it was all about Kejriwal. He was in the studios, he was lying on the streets, he was here, he was there, he was waving his finger about, he was throwing a press conference, he was tightening his muffler, he was coughing into the mic. In AAP 2.0, he wisely became the leader, the statesman, sitting back and coordinating, the cool politician that south Delhi-tes would say “choo chweet”. But then South Delhi isn’t Delhi. So AAP had different faces to appeal to different people, Yadav, the kind self-deprecating uncle with a silk-smooth voice, Khetan, consistently on the attack in TV studios, Ashutosh raising Hell on social media, keeping the base riled up with wild conspiracy theories every morning, and Somnath Bharti Luther King with his feet on the ground, because Delhi. In addition, Kejriwal fielded pragmatic candidates , of questionable AAP quality, in outer Delhi, went easy on the “We are a social movement” and accepted that there were in the politics business, and ensured a wide targetting of different sections, Muslims, migrant workers, housewives, angry old men, and the effectiveness of that is attested to by the final vote tally. As an independent voice, I welcome the arrival of AAP. Any working democracy needs a strong opposition and right now, with the increasing obsolescence of Congress party, the BJP does not have a credible antagonist at the national level. There is thus space for a party like AAP to emerge to take its place. With Delhi at an impregnable base, AAP can now again dream of conquest, but hopefully they have learned from the last time, the perils of spreading themselves too fast, too thin. A slow, graded, less greedy approach, predominantly concentrated around urban centers (and no I think UP is a bad move) would be the best strategy forward for them. As for BJP, the lessons should be clear namely that the people who really vote, they don’t really care for Modi hugging Obama or advice to produce more babies, because it’s not something that really helps them in their lives. I hope you get what I am saying. Also I sincerely hope that this defeat does not lead to the rise of the old BJP, both the shrill Hindutva-hawks as well as the protectionist-populist Swadeshis. Finally congratulations Delhi. You will have five interesting years. Panch sal kejriwal will make delhi just like Pacchim Bengal. I am more worried that BJP might draw wrong lessons and roll back whatever little reforms they have been planning in the coming budget. Mohan Guruswamy: “The power of the Delhi government today does not amount to much. The Delhi government does not control the police. It does not manage the Delhi Development Authority (DDA) who is the largest owner of land and who has inflicted the most ugliness in a city once known for fine architecture. It has a multiplicity of municipalities leaving the Delhi government as little more than a provider of low-grade education, insufficient water and expensive electricity. Till not long ago Delhi was not even a state. Its government was an extended municipality managed by an elected Chief Metropolitan Councilor. And with good reason too. New Delhi is also the seat of the Government of India and no national government should be the subject of another government. But as local politicians clamored for a state and for a greater share of the power and pelf, the Union of India in its wisdom conferred statehood in 1992 under the National Capital Territory Act. This envisaged a limited statehood with law and order with the Union Government. Thus, the real power in Delhi still vests with an appointed Lieutenant-Governor who reports to the Union Home Minister. Few in Delhi care for a CM who can do little of the things people expect from a person in power. This is the cause of much tension, as elected officials want the powers enjoyed by most other states also to devolve to them, the Union Government loathe to cede any of it. Contrary to popular perception the Home Minister of India enjoys very little raw power, the kind of power politicians seek. The period from Sardar Patel who enjoyed near supreme power to Sardar Buta Singh has seen the erosion of most of the Home Minster’s powers. The IB reports to the NSA who in turn is an official of the PMO. The CBI reports to the Department of Personnel whose minister is since the last days of Jawaharlal Nehru is the Prime Minister. But the Home Minister is in full control of Delhi. Little in Delhi can happen without his say so. This is the major underlying theme of the AAP struggle now. It wants full control of Delhi, and the BJP, which also till not long ago wanted statehood, stands for the status quo. I think it is possible to reconcile the conflicting pulls of a Union Government and the State Government. A powerless State Government is not conducive to the orderly development of Delhi. An all powerful Home Minister, unfettered by responsibility to a local constituency, and acting through an appointed LG is what has turned Delhi into the mess it is. On the otherhand we cannot have a Union Government being held in thrall by a powerful State Government. There is profound irony in this analysis. Modi is essentially a corporate project that rode to South block on the disenchantment fuelled by IAC. RSS & BJP genius lay in using the IAC to advance their interests. Modi ran with a reformist narrative that won him elections against a party suffering from anti-incumbency. If Great Bong fashions himself as “independent voice”, he should explain what are the aspects of Modi’s record as CM that justify national imagination of him as a reformer. It is precisely this narrative of being a reformer with great communication skills that is unraveling with time. Corporate media created this myth and remains hugely sympathetic in scrutinizing his record till now. Great Bong still thinks Modi is capable of winning LS elections again. I would argue, people will never hand that kind of mandate to either Modi or even Kejriwal. In between both, Modi has already wasted his mandate by misinterpreting its meaning. Modi also can achieve much less, because he lacks a 2nd rung leadership, will to act against his loony right brethren and the capacity, time and leadership to govern effectively. I am sure Modi will be voted out in next LS elections and then will face the demons from his past. He will not win easily against non-congress opposition and will only govern in reaction to Kejriwal govt from now on. The wave has receded, Modi sympathizers are left naked. No amount of hand wringing can bring back that high of 2013. To argue Delhi is Bengal and Kejriwal is Basu, betrays an understanding of where he is coming from, and the mind of the Delhi voter. if Modi wants to be a reformer, he should try and match AAP with transparent funding norms and clear policies that benefit the common man, instead of using empty symbols like Kiran Bedi. Agree with many aspects of your analysis, while some of Greatbong’s too. While he still seems too beholden to this myth of the great reformer that is Modi, he conveniently refuses to see the real Hindutva agenda of Modi and his Sangh masters. But at least he is mentioning the Sakhji Maharaj’s and Sadhvis now, even while downplaying them considerably, which is quite an improvement over how smugly he used to react to such incidents in the past. But clearly the belief that Modi is somehow separate from these elements and ‘statesman’ like is still dear to him. And I agree entirely, he can lose political capital very fast, due to lack of 2nd rung in BJP. Let’s forget national election. If LS election happens again in Varanasi only between Modi and Kejriwal.. who do you think will win today? Your answer will definitely be Kejriwal but coming from the hinterlands, I can tell you that he will be thumped again by a bigger margin. Delhi might see him as a hero but people of Varanasi will see him as the opportunist who left Delhi to become PM. Never visited Varanasi after that..
What works in AAP’s favor is that they do not have a track record. The next 4 years will give them a track record and will also be the deciding factor for national election. The only way to beat Modi and BJP is to enter a two corner fight and that will require support from regional satraps like Mulayam, Mamta, Maya, Lalu, Nitish, Jaya etc.. That itself is a recipe for disaster. So let AAP be happy with the post of glorified mayor of Delhi.. And go low and slow on the national dream. In Politics, older you get better I am at criticizing you! Let us hope AAP doesn’t resort to the politics of blame game, still feel bad that they didn’t even spare the election commission. This is the official takeover by the JNU old boys club. All over the media it is projected as if 15 Lakh security camera are impossible to install, in my society we installed 40 security camera on gate, lift, entrance etc. of various types, total cost is approx 8 Lakh, so per camera cost is Rs 20,000 with recording of one month, all cabling etc. So for total of 15 Lakh camera it will be 3,000 Cr, if you split it over 5 year, it will cost 600 Cr per year, in bulk it will cost even much lesser, this amount is less than 2% of 40,000 Cr Delhi Budget, so how it is impossible to achieve ? why are you forgetting the maintenance, protection and supervision of 15 lakhs camera? These costs will be much higher than only installation of cameras. Cameras come cheap, but the screens on which monitoring happens is costly, you will also have to setup a whole infrastructure to support the functioning. Even in a city like London, there are only 3 lakh cameras. yhea. The bad elements will keep disabling it unless police is monitoring from some location and staff will have to be employed. Maintenance of it would be a nightmare. If you watch documentary “katiabaj”, the electricity workers only taught how to steal electricity. So camera maintenance people can teach elements how to diable or how to not get caught. Bottom line is that the idea is AWESOME to prevent rapes and eve-teasing and increase women’s safety but implementation is much harder. Better to have the women wear a camera with livefeed going to police/central location. Or police escorts. Again all this will also cost money. But someone should do something to keep these elements scared. Maybe catch them and display them publicly!!! That would serve them right. Now sure why Modi hasn’t done anything yet on increasing women’s safety in Delhi. At bulk it should cost about 10-15k per camera, isnt it? Hold on friend. Maharashtra govt has ordered for 6000 cctv for Mumbai surveilance for approx 1000 crore @16 lakh a piece. Is populism a bigger enemy or corruption? How much other govts spending on statues etc? If poor is given cheaper electricity (obviously there is conditions apply which media is ignoring) is it a bigger problem? Even if he installs 1 lakh cameras and reduces crime to good extent …coming of kejriwal would be justified. Voice of reason in the midst of all the hoopla. You made sense. A lot of it. What I didn’t like though, as far as the media is concerned, is the reasons they brought up for Kejri’s win. Yes, the right wing brigade is one of the reasons. But not the biggest reason. 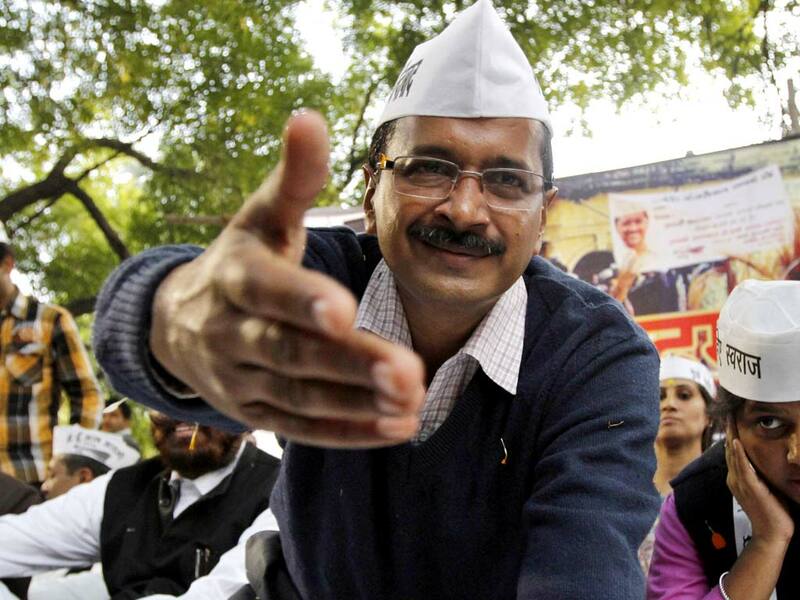 The biggest reason for Kejri’s win is that Kejriwal is really the only major party to talk about Lokpal and corruption. And he was involved in a movement for the bill. So people wanted to give him a second chance. I am not saying he will implement but people still trust him more than Congress or BJP. Why do you ignore that? You talk about him as if he is one of those useless populist third parties promising the moon. But he is somebody who has promised (and acted) to counter corruption. It seems we can save a lot of money if we act against corruption itself. Do you know the level of black money that India has? That in itself can pay for thousands of CCTV cameras, free water or whatever. For the whole country. Somehow you guys want to bring him down and paint him as a crappy Janata dal clone. All because you support the great Modi who supposedly is going to turn India into Singapore. We have seen little proof of even a small movement towards that in the last few months. I am glad they won. Now it is THEIR responsibility to fulfill all their promises. Hopefully he gets to install those cameras at least. wifi would be good too. Hopefully he and Modiji work together. Who knows? In future Kejri may join BJP and might become future PM. At least Delhi lutyens wala kay haatho say gayi. It went to the most deserving person. Good for BJP. Lets all now refocus on ‘development’ with whatever little bit of black money we have been able to get on ‘donation’ from the corporate walas. That money should help in economic development. robbing peter for paul..etc etc. He has come up with analysis I agree with!! isn’t it easy to figure out how BJP allowed the Delhi election go out of hand. By not declaring candidates on time or by not publishing manifesto on time or by projecting a last minute outsider as a CM candidate who never attended RSS shakha in past. The same BJP has managed to win 29 seats in recent delhi elections, all LS seats in Delhi and almost all Jammu seats, Haryana seats few months back, which are some or other way linked to Delhi. Politics is BJP, but in my view, politics is not as easy as we see, but not difficult to understand either, if we remove that aam aadmi’s chashma and mindset. I was in Delhi for a couple of days to attend a summit and happened to talk to the cab drivers on the way on AAP, the freebies and all that around. They all were confused at the mindset level. Not sure whether the new robbinhood will bring that money and happiness from the rich and distribute. Similar to those who drop a 100 rs. Note in temple’s dakshinapaatra and think the deity will make everything right. We indians anyways have crore of gods, we recently added a Modi in list to worship and Delhites added a Kejriwal. Now that the daan of vote has been dropped in the election paatra, inside the temple of democracy, lets wait for these deities to perform. amen.